Cycle campaigners from across the UK will be coming to Edinburgh on November 6th to attend the Spokes/Cyclenation/CTC conference. Let us know you’re coming to the ceilidh [link] Details are now finalised … Saturday 6 November, 7-11pm, James Gillespies High School, 57 Lauderdale St, Edinburgh EH9 1DD. Music from the Strathspey and Reel Society. £5 entry, includes nibbles – some beverages available or bring your own. The conference takes place on Saturday 6th November at the Eric Liddell Centre, 15 Morningside Road, EH10 4DP. 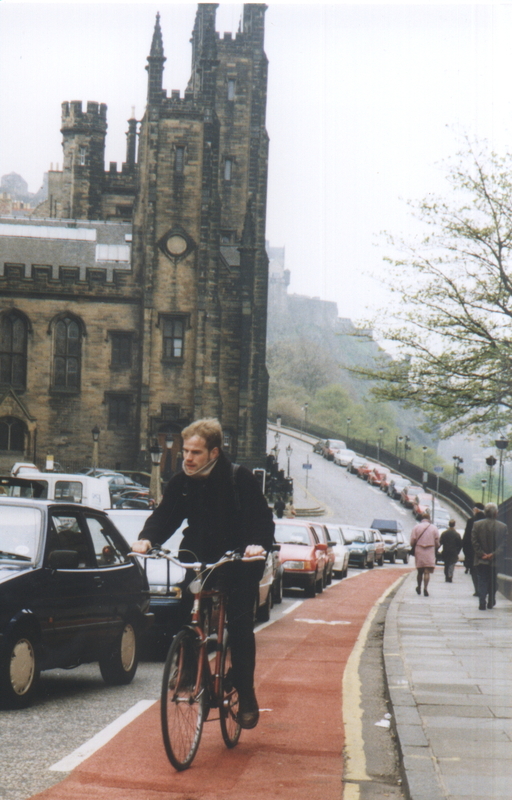 Delegates arriving at Waverley station will have the chance to sample some of Edinburgh’s cycle facilities, including the cycle lanes on the Mound and the paths through the Meadows and Bruntsfield Links, in the 20 minute cycle to the venue. 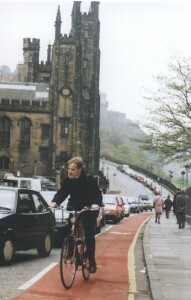 Cycling up the Mound on the cycle lane - a successful Spokes campaign. The conference starts at 10am with a welcome from the chair, Professor Tom Rye of Edinburgh Napier University, and from Spokes as hosts of the event. The first session – entitled “A Tale of Two Cities” will present a comparison of the work to encourage cycling in Edinburgh and London, with Cllr Gordon Mackenzie, chair of Edinburgh Transport, Planning and Environment Committee talking about why Edinburgh has signed up to the Brussels Charter target of 15% cycling share by 2020. Jennie Calvert from Transport for London will describe the impact of London’s high profile initiatives such as Cycle Superhighways and self-service cycle hire. Dave du Feu from Spokes and Ashok Sinha from the London Cycling Campaign will add a commentary from the campaign perspective before a panel discussion involving all four speakers. The compare and contrast theme moves to a national level after the coffee break, when the policies at national level (Cycling Action Plan for Scotland and the English Active Travel Strategy) come under scrutiny. Ian Aitken from Cycling Scotland and Phillip Darnton from Cycling England will give initial comments about the likely impact of the Spending Review, and speakers from the relevant government departments have been invited. cycle hire – report from the OBIS project and results from Dublin, Dumfries and Cheltenham. For those arriving in Edinburgh the night before, there will be a social evening at the Bike Station, 250 Causewayside, EH9 1UU, with refreshments and takeaway food available. This is the chance to see Scotland’s pioneering social enterprise which refurbishes and sells donated bikes (20,000 donations since 2001) as well as organising cycle training for children and adults, self-help repair workshop sessions, build your own bike courses and a £750,000 travel behaviour change campaign “A Better Way To Work” (www.thebikestation.org.uk). On Saturday evening, Spokes will host a ceilidh. Lothian CTC will organise a range of cycle rides on Sunday 7th November, ranging from a short guided tour of central cycle facilities to medium and longer rides in and around Edinburgh. As always, hospitality will be available in the homes of Spokes members alongside a wide range of accommodation from hostels to five star hotels. All delegates will receive a free copy of the latest Spokes Edinburgh Cycle Map as well as conference entry and food for the £20 booking fee. The Saturday ceilidh will be charged extra, with tickets available at the conference or on the door.